iPhoto is one of Apple’s most popular applications. Bundled with every new Mac since 2002, millions of people have imported and manipulated billions of photos with this useful software. Every time you plug your iPhone or another camera into your Mac, iPhoto leaps to the assistance (whether you want it to or not). With success come challenges. One common thing I’m asked about as an Mac consultant is how to manage iPhoto libraries that have gotten out of hand – thousands of photos, lots of duplicate items, and sometimes multiple copies of libraries. How do you get all this under control? By far one of the most common issues people have with iPhoto is too many photos. Libraries of 5,000 – 10,000 pictures are commonplace these days, and I’ve seen some with over 50,000 photos! The more pictures you have, the longer iPhoto takes to launch and run. Whether this is the result of duplication problems or just an overzealous photographer – do you really need 3,000 pictures of your cats – things can quickly get unmanageable. Every time you import a batch of pictures, iPhoto creates a new Roll in the Photos pane. Whether you import one photo or a few hundred, each is a separate roll. Over many years, that’s a lot of rolls. 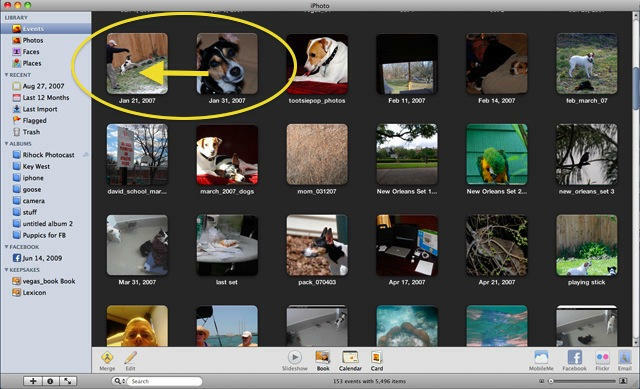 Since iPhoto ’08 Apple has included an organizational tool called Events which helps simplify the grouping of photos. By default every Roll is also an Event. However unlike rolls, events can be merged by dragging one event on top of another, or selecting both events and choose Merge Events from the Event Menu. iPhoto will confirm whether you want to merge the items, then create one new event with the contents of both. You can repeat the process as needed, eventually consolidating your library into a smaller group of events to manage. Once merged, related photos can be viewed in one place and unneeded items pruned out. Events can be created by date, topic, location or whatever suits your needs. To rename an event, double-click on its name in the iPhoto window. Sometimes you have multiple copies of your iPhoto Library on one or more disks, backups from older computers at different times. Some may have unique contents, others may be redundant, how can you tell? To browse a different iPhoto Library, hold down the Option key when you launch iPhoto. This will bring up a window showing you all available libraries on your disk(s), as well as the option to create a new library. This is an easy way to browse the contents of old data and switch between multiple libraries when needed. iPhoto will remember your last choice of library and use that going forward, so remember to quit and relaunch iPhoto with the Option key held down a second time to reset the library back to your original location. If you have two or more libraries that are unique, or largely so, and you wish to merge them into one library, the best tool for the job is iPhoto Library Manager. This handy utility let’s you merge (or split) all or part of one library into another existing library, or create a new library from the contents of both. With large libraries (multiple gigabytes) the operation can take many hours, but that’s still faster than doing things by hand. 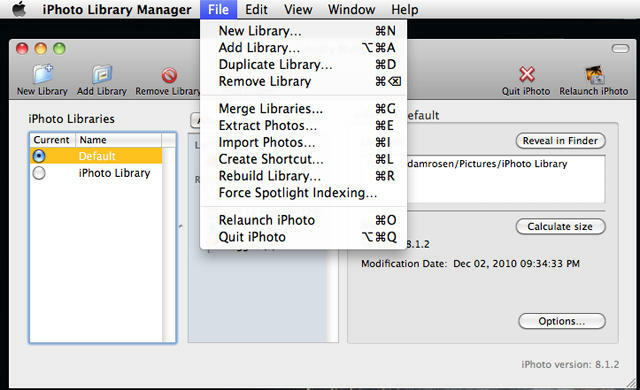 iPhoto Library Manager can also repair corrupt libraries that won’t open, or help rescue data if the library is unfixable. Well worth the modest US$20 cost if you work with iPhoto a lot. So now you’ve merged libraries and events, and you have duplicate copies all over the place. Six copies of the Thanksgiving dinner, three of last summer’s vacation, and all these thumbnails all over the place. Now what to do? Apple does not provide a way to remove duplicates directly within iPhoto. Why after nine versions of the program they can’t include this feature is a mystery, but fortunately another handy utility comes to the rescue. 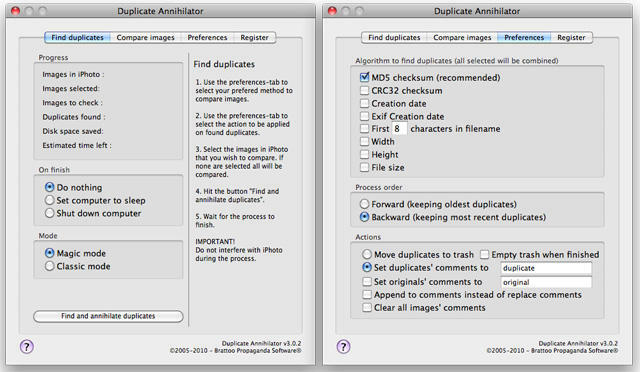 iPhoto Duplicate Annihilator is a simple application that helps do just what it says, for only US$8! The program scans the pictures in your library and tags all duplicate copies it finds by putting “duplicate” in the comments. You can use the program’s default algorithm or try tweaking parameters yourself in the preferences. This process can also take many hours for large libraries. When it’s finished, go to iPhoto and search for “duplicate” in the comments (the search box is at the bottom of the iPhoto window). Items which appear are the duplicates found by the search, and can be deleted or consolidated for further review in a new event or album. Any events or rolls in your library that are labelled as Thumbnails can also be safely deleted. Most of these appear when you import one iPhoto library into another rather than doing a clean merge. Any thumbnails needed by iPhoto (for low-res views in grid mode) will get recreated by the program if they are missing. 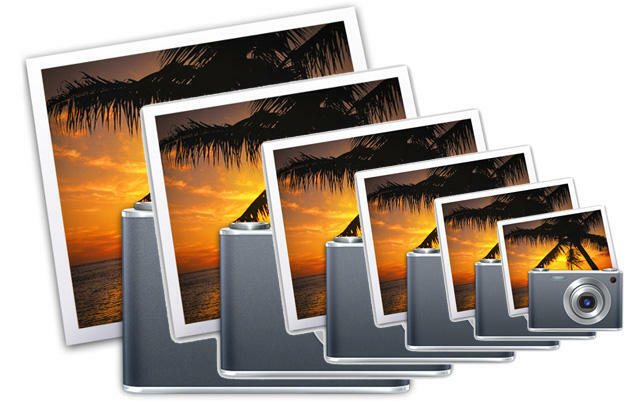 The iPhoto Library on the disk is a collection of nested folders and files, containing your original photos, edited versions, thumbnails, etc. The organization of these files is confusing at best. There are folders named Contents, Data, Modified and Originals, caches, thumbs, data segments, et. al. all sorted granularly by day/month/year. There is a lot of redundant data and copies of things from eons past. Modifying these files outside of iPhoto can cause data loss or library corruption. I’ve worked with quite a few clients who have tried a bit of de-duplication and pruning of their iPhoto libraries to free up disk space, and wound up with a bigger mess than when they started. iPhoto versions prior to ’06 allowed you to directly browse and modify this data via the Finder. Over time Apple realized too many people were mucking around, so they came up with a solution to the problem. 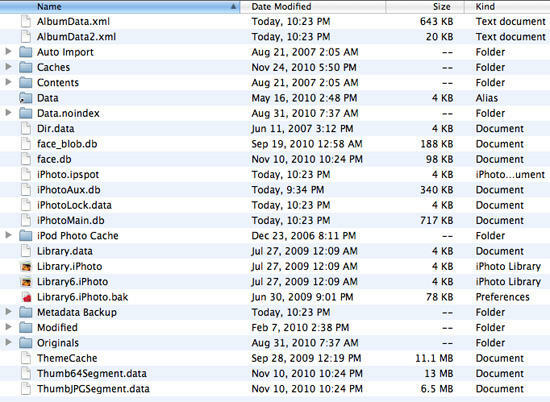 As of iPhoto ’08 the iPhoto Library folders are hidden inside a single monolithic file called iPhoto Library. Now there’s just one huge thing on disk, and don’t you mess with it. The iPhoto Library is just a Package file, which is essentially a camouflaged folder. If you’re curious what’s inside, right-click (or control-click) on your iPhoto Library and choose Show Package Contents. The mess is still there. But if you must peek, just browse. Use iPhoto or the utilities mentioned above to make changes to the library if necessary.